EKK – Who’s Coming Up on Monday, February 4? Who’s Coming Up on Monday, February 4? 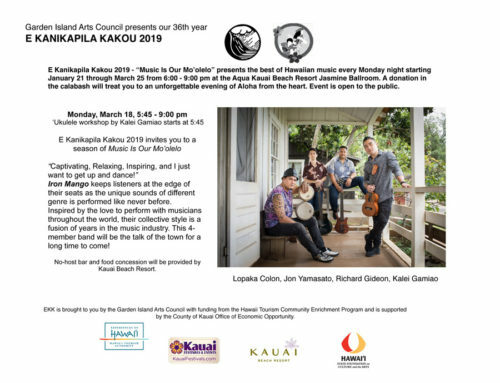 EKK 2019 continues its 36th season with the unorthodox musical stylings of Brother Noland, well known for his ground-breaking explorations of Hawaiian music in a myriad of styles, many uncategorizable because he is a musician, composer, entertainer, storyteller who definitely operates outside of the box. The last time Brother Noland graced the EKK stage was in 2012 when he performed with the “Songbird of Miloli’i”, Diana Aki, who just recently bid adieu to join the many musical legends who now play heavenly music. Many of these old-timers took Noland under their wings when he was a young musical prodigy breaking into the business over 40 years ago. “Noland – fully animated, shocking white pony tail, huge expressive eyes, a seasoned performer who demonstrates a wide range of musical styles but definitely a recognizable way of “Nolanizing” songs with his finger-snapping Jawaiian beat and Sachmo growl.”Little has changed except that he’s “lost” his usual dark shades so you could really catch his expressions. Dressed in colorful Jams aloha shirt and sporting his space-age looking electric blue carbon fiber guitar sponsored by Composite Acoustic in Lafayette, Louisiana, he was stylin’ and ready for action. Today Noland is the one who takes young musicians under his wing and actively mentors young people not only in music but life in general. Wherever Noland travels to play music, he has musician “units” or bands all over the country and on every island. He came prepared to have a really great evening with his Kaua’i back-up musicians. Excellent musicians like Darryl Gonzales and Garrett Santos bring to the music their own special way of playing and that gives Noland a fresh charge. That’s why he looked so happy playing music with them. His opening number, In The Real Old Style, was perfect to set the stage for the evening ahead by a musician who embodies the Hawaiian-ness of one who grew up living in close communion with the land. He lived in Moku-o-Keawe (Hawai’i Island) with his hanai family. At age 16, he was a free spirit running along the slopes of Mauna Kea in an area called Mana, next to the Parker Ranch. Here is where music captured him. Piggy-backing his toddler niece Tara Bianca Ku’uleilani Mossman, he roamed the vast fields of the Parker Ranch watching the fog roll in and listening to the sound of the pueo. The next day he wrote the Pueo,Tara & Me for his niece. When he sings, he is actually telling a story about a moment in his life, recalling an incident that has become part of the fabric of his life. His singing has so much feeling with the softest accompaniment of his guitar in tandem with his emotion-filled voice. While in Kona he never had a girlfriend because if he did, she would most likely be his cousin. So he devoted much attention to his newfound passion . . . music. His life took a major turn from growing up as the hanai son of the Daniels family on the green pastures of cowboy country Kamuela when Noland’s mom called him to take a test in 1964 which he passed. His life style changed drastically as he had to cut his hair, wear shirt and shoes and get his schooling up on the mountains of Kalihi in a gated community called Kamehameha Schools. But music continued to play a big part in his life. He spent a lot of time in Waikiki doing the lu’au circuit where he happily watched hula dancers swinging their booties in front of him; this inspired the song Tropical Baby with a distinct reggae beat and captures this pleasurable slice of time in Waikiki. Recorded by Na Leo, Ohta-san, and the Cazimero Brothers, this song has provided great returns in quarterly royalty checks. Fast-forwarding to his current life with new pleasures, he revealed a rare softer romantic side. He shared a story about visiting New York City at Christmas time with his wife, excited about taking a selfie in front of the Rockefeller Center Christmas Tree. Hearing that “layering” is important in cold weather, he dressed in seven aloha shirts, nine Quick Silver pants and four socks because he had no jacket; people stared at him. Coming in from the cold, he was so inspired by the experience that he told his wife he composed a song for her with New York vibes. “Really?” was her comeback in disbelief. When he sang it for us, it was really quite romantic and showed off Noland’s mastery of timing which is a signature of his performance. He actually does not sing his songs; he emotes his songs with interludes of sophisticated jazz and Sachmo-like sounds. Song was simply titled It’s You. One of Noland’s main passions is to teach young folks how to survive in the wilderness, which he calls the outdoor classroom. He feels it’s important to know how to survive whether in Molokai, the Waikiki Jungle or on the rail. In his survival program, he is “Tutu” or “Pops” to the students. They are surprised to learn about his other persona who sings and appears on album covers. His experiences with students in this program are captured in his books on survival – Hawaiian Survival Handbook. The copies he brought for sale were snapped up in a jiffy. I once watched Brother Noland talking about his survival program on television; his down-to-earth, no holds barred instructions to youngsters is so typical of who he is. One of my favorite songs is Noland’s version of Keola and Kapono Beamer’s Mr. San Cho Lee which pokes fun at characteristic ethnic quirkiness of local folks in Hawai’i. It was embellished with sound effects, musical accompaniments, and recognizable ethnic body languages. As Noland pointed out, it may seem like we are making fun of each other, but in essence it is the Aloha way that friends and neighbors of different ethnicities acknowledge our differences and still get along with each other. 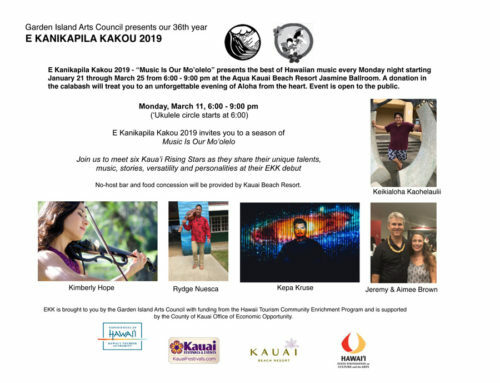 Calling up the two Kaua’i musicians, all three launched into an energetic Kona Kai ‘Opuagiving Darryl and Garrett a chance to show off their pa’ani. Noland was no longer performing; he was just having a great time jamming with his two buddies. He pointed out that like a surfing adventure, each time they play the song, it’s different. The ocean has always a big part of Noland’s life. He spoke about the “Nation of Miloli’i”, one of the two remaining traditional fishing village still existing in Hawai’i. It’s a place where everyone in the community fishes together, cooks together, and plays music together. He sang Eugene Kaopiko’s many-versed song about fish, selecting the ‘opelu,‘ama’ama, ‘o’io, and shared stories about how best to prepare steamed fish and make raw‘o’io poke. He can easily go off on a tangent describing the special preparation of delicious fish dishes as if he were on a cooking show. He really should be invited to go on a cooking show. When Noland was asked to play the Kamoa ‘ukulele that was going to be given away later, he continued with the fish song and then moved on to Hi’ilawe which he taught the ‘ukulele circle earlier in the evening. Beautiful hula dancer Po’ai Galindo went up to dance the story of the lovers who ran away to be together under the waterfalls in Waipio Valley. Darryl and Garrett went to town on the pa’ani. After the intermission, six lucky participants who signed in won CD’s from our wonderful artists. The big win of a beautiful Kamoa ‘ukulele went to Marie-France of Montreal, Quebec. Using the 1990’s revival of the 1950’s Stand by Me as an example, Noland pointed out the importance of teaching his children and grandchildren to understand the importance of intellectual property because that is the legacy he is leaving them with all the songs that he has composed over his forty years of music-making. 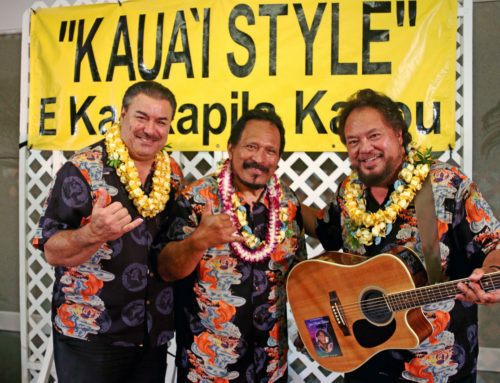 One of the mainstays of his repertoire is A Great Hawaiian Man which he wrote with his brother Tony Conjugacion. Last November Noland experienced what he considers one of his most unforgettable gigs when he was asked to play at the “Celebration of Life” for a twice-Silver Star-decorated veteran of the Korean and Vietnam war who was to be buried at Arlington Cemetery. The entire event was amazing with the marching band, 21-gun salute, two-and-a-half mile walk, jet formations, the taps, the flag-folding ceremony, the coffin draped with maile and orchids, all part of this occasion to honor a fallen soldier. When the priest said, “This man deserves to be in this hallowed ground,” it was the most chicken skin moment for him. Noland followed the official ceremony with his rendering of A Great Hawaiian Man. You could see how much the experience moved him as he claimed this to be one of the most memorable performances for him. Many of his songs are influenced by his early lifestyle with his Hawaiian tutu who taught him to swim or sink and the fishermen who taught him to fish. A Great Hawaiian Manwas one of the soulful songs that came out of these early experiences. He shared recollections of his younger days when he was taught to swim Hawaiian style by his tutu. He took the youngsters out to the second buoy, anchored the boat and begin the swimming lesson Hawaiian style. One by one, the kids were hurled into the ocean to swim or sink. Over and over they were tossed out like footballs and surfaced with frantic cries of “I cannot swim! I cannot swim!” only to be tossed out once again. Finally, they caught on and came up gurgling with “I can swim! I can swim!” This completed the swimming lesson. Big Ship is one of Noland’s well known “call and recall” songs that he loves to sing with the audience. The three really got carried away on this reggae-beat song with Darryl ripping away on his pa’ani, audience calling out, “ . . . Hold on . . . Hold on . . . Hold on . . !” They could have gone on all night. Last year Noland’s young “team” of millennials convinced him to attend the Na Hoku Hanohano Awards. Not knowing that he was to about to receive the “Slack Key Legacy Award”, a very high honor, he was wandering around outside the ballroom and missed receiving his award. “Typical him; always like that; no can find him!” is what he overheard. LOL. Queen Kapi’olani’s love song Ka Ipo Lei Manu (He Mana’o He Aloha), written for King Kalakaua when he visited the mainland as Hawaii’s Ambassador of Aloha, describes the king as the i’iwi bird. Unfortunately, he died at the Palace Hotel in San Francisco and never heard the song, but as his body was brought back to Honolulu Harbor, Hawaiians lined the shores, chanting this song, to meet their king. On a lighter note, Papalina Lahilahi (My Baby Has Rosy Cheeks), is one of the hula numbers that he rearranged Noland-style, much to the chagrin of his kumu hula Mother. She locked him in the bathroom with a dictionary and a bible. Hula dancers jumped on stage. 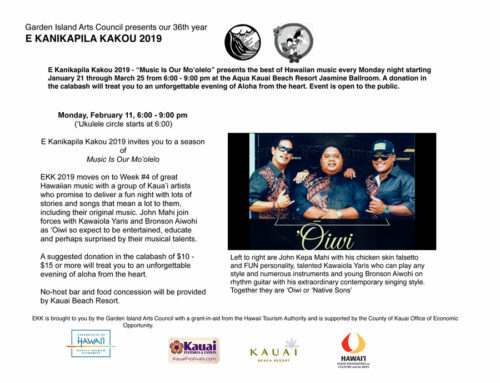 Po’ai Galindo, Mahina Baliaris and the incredibly talented Maui’ola Cook whose version of the hula was so comedic and animated that folks will be talking about it for a long time. We are so lucky to have so many hula dancers who are moved to share their hula; our audience loves it and so do the performers. Living on Pua Lane in Mayor Wright’s “estates” in Kalihi-Palama, sometimes called “Hell’s Half Acre,” led him to compose one of his better known songs – Pua Lane (Poor Lane) — to which he bid adieu in his song. Even as a youngster he composed his own songs but would not admit it openly as writing poetry while playing football was not considered too cool. Gaining reputation as the “rockajamma” guy, he became more open about his poetry. Today, his gift of poetry is what has stood him in good stead as Noland claims his original compositions helped him put his three kids through college. One of the top songs in his repertoire is, of course, Coconut Girl, about the high fashion girl. No Noland performance would be complete without the interactive singing of Coconut Girl with the audience. So what if he sang it over a million times. Too much fun! As the evening comes to a close and everyone is holding hands and raising their voices to sing Hawai’i Aloha, smiles on their faces and tears streaming down their cheeks, you know you have experienced yet another great session at EKK. It’s moments like this that live on in the memories of those who are for the first time witnessing and receiving the experience of a tangible aloha … it’s the gift of EKK, and they are forever held hostage to the beauty that is Hawai’i. If you have a disability and need assistance for Monday events, email Garden Island Arts Council at giac05@icloud.com. 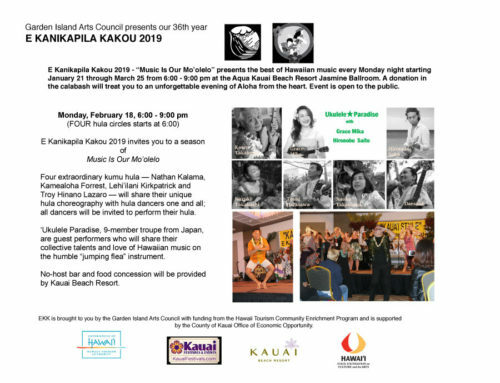 Funding for E Kanikapila Kakou 2019 Hawaiian Music Program is made possible by Hawai’i Tourism through the Community Enrichment Program, with support from the County of Kaua’i Office of Economic Development, the Garden Island Arts Council supporters and the Kaua’i Beach Resort. Garden Island Arts Council programs are supported in part by the State Foundation on Culture and the Arts through appropriations from the Hawai’i State Legislature and the National Endowment for the Arts. Copyright 2012 - 2019 Garden Island Arts Council | All Rights Reserved | Problems with this website? Please email Andarta Design | Mahalo!